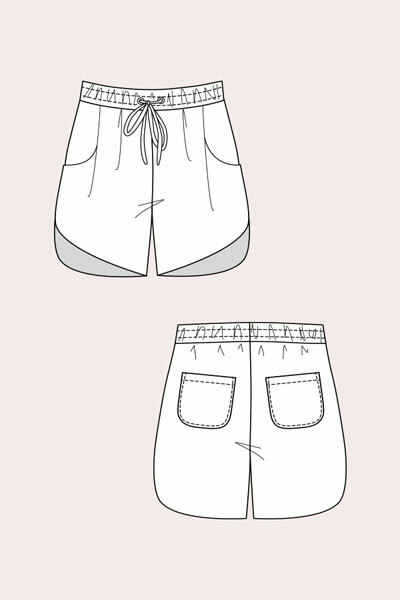 The Alexandria pattern includes two variations: casual peg trousers and relaxed shorts. Both styles have an elastic waist with a drawstring closure and a loose and relaxed fit with a normal rise. This style is provided as a digital pattern. The patterns can be printed on any standard paper sizes (such as A4 or letter) and taped together to create a complete pattern sheet. The patterns are usually divided into different files, two sizes per each file, with a separate instruction file. Patterns include all seam allowances. When you complete your order, you will be provided with a unique code to instantly download all sizes of the pattern and the instructions. See our digital product policy for full details on purchasing this digital pattern. 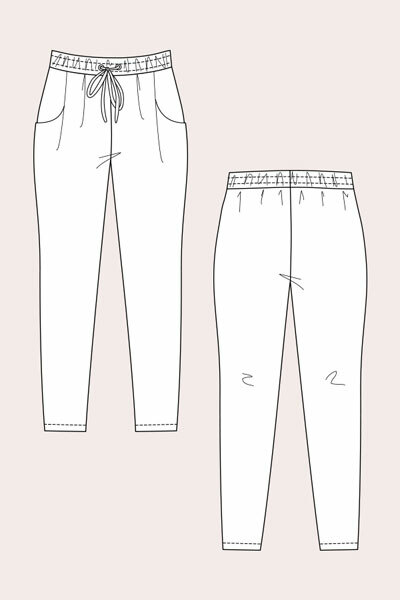 The Alexandria pattern includes two variations: casual peg trousers and relaxed shorts. Both styles have an elastic waist with a drawstring closure and a loose and relaxed fit with a normal rise. The pattern has four pleats at the front waist and curved front pockets, with the pocket opening partly hidden under the pleat, with patch pockets at the back. 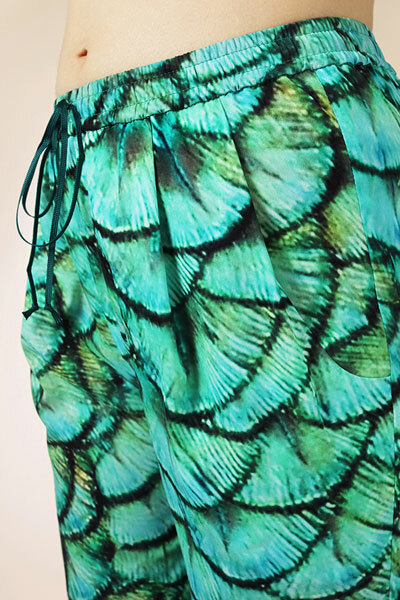 The pattern features narrow trouser legs, and an uneven dolphin hem on the shorts. Choose a light to medium weight woven or knit fabric: for example crepe, satin or other trouser fabric with drape. For a more sporty look, pick sweatshirt jersey or a similar knit. Fusible interfacing for trousers (waistband): 25 cm / 10"
Fusible interfacing for shorts (waistband & facings): 50 cm / 20"
Drawstring cord: approximately 200 cm / 75"
Fabric requirements and finished measurements are available by clicking on the last image at the above right. 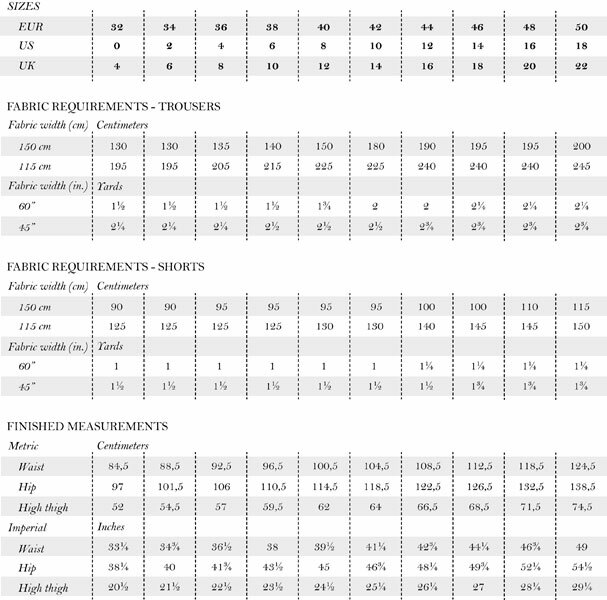 All fabric requirements calculations include a 5% shrinkage allowance. This Named pattern comes in sizes EUR 32-50 (US 0-18/ UK 4-22). Remember that the fit of a garment also depends on the style of the garment and whether it is fitted or loose. Each pattern will come with instructions that include a chart of finished garment measurements for all sizes. All Named patterns are designed for a 172 cm tall woman. 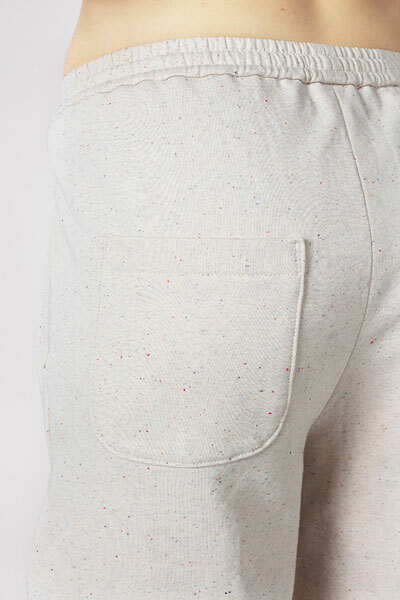 You can always make your garments shorter or longer by amending the pattern. Please refer to the pattern alterations section of the Named website for further information on how to alter a Named pattern. If your measurements don’t fit one of these sizes you should go with either the closest chest or hip measurement, depending on the pattern in question. It is recommended that you choose the size with the closest chest measurement for tops, dresses and coats, and the closest hip measurement for pants and skirts. Chest measurement: Measure your chest across the fullest part, on top of your bra. Keep the measuring tape horizontally straight at the sides. Waist measurement: Measure against your skin, around the narrowest section of your waist. Hip measurement: Measure your hips at the widest part, on top of your underwear. Keep the measuring tape horizontally straight at the sides. Note that the widest part can also be the top of your thighs. 32 0 4 30" 23 1/2" 33"
34 2 6 31 1/2" 25 1/4" 34 1/2"
36 4 8 33" 26 3/4" 36 1/4"
38 6 10 34 1/4" 28 1/4" 37 3/4"
40 8 12 36 1/4" 30" 39 1/2"
42 10 14 37 3/4" 31 1/2" 41"
44 12 16 39 1/2" 33" 42 1/2"
46 14 18 41" 34 1/2" 44"
48 16 20 43 1/4" 37" 46 1/2"
50 18 22 45 3/4" 39 1/2" 48 3/4"
I made these with a knit to make a fancy sweatpant - I have only made pockets a few times but was able to follow the instructions well and they came out great in a knit. I recently sewed these up for my 16 year old daughter and I was very pleased. I was surprised at the printing, two sizes are printed at a time, which makes for clearer tracing but could cause problems if you need to blend a larger size range. As my daughter is 5'3 I shortened the leg, as advised. I simply used the lines provided and it was quite straight forward. The sewing instructions are clear and the pieces go together well. The resulting pants hung beautifully. I made them in apparel velvet back vinyl with cotton modal for the pocket bags, a challenging sew but a stunning result. My first time sewing with this company but I was happy with the result. I look forward to making these for me in a soft denim, as a casual pant.